Are you looking for a ladder accident lawyer in New York? Ladder accidents are among the most common causes of workplace injury and death in New York, particularly at construction sites. Whenever construction workers need to work at heights above ground level or a lower structural level, the risk of injury or death increases dramatically. Specific laws and rules have been enacted in order to protect construction workers who are required to work at various heights. These laws mandate that certain types of ladders or scaffolds be used for a given job and they also mandate how those safety devices are to be properly utilized. For example, an extension ladder may be the safest method of performing a particular job, but only an A-Frame ladder is available. That A-Frame ladder is the used and it is not long enough to perform the job safely and an accident results. In New York, our Labor Law places the responsibility on both the building owner and the General Contractor at a construction site to insure that the workers are given the proper ladders or other safety equipment to perform their jobs safely. For more information on the applicable laws please visit our Construction Accident Page. Not only do the laws in New York require that proper ladders be provided to construction workers, the laws also require that an owner and general contractor at a construction site insure that the ladders are not defectively maintained, placed or operated. All too often, workers at construction sites in New York are injured because they are forced to use a ladder that is old or broken and serious injuries result. The threat of termination or other repercussions often forces workers to use ladders and other equipment that they know is either unsafe or unsuitable for their job. 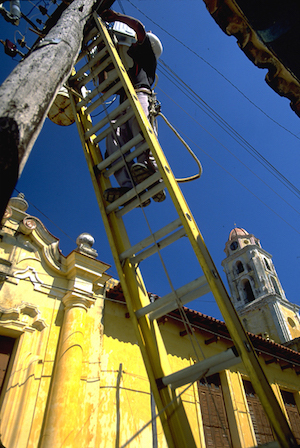 There are many different types of ladders in use at construction sites throughout the State. They include A-Frame ladders, step ladders, platform ladders, extension ladders with rubber or metal feet and rolling safety ladders. There are proper and recognized methods of use for each type of ladder. It is crucial that employees utilizing these types of ladders receive training on the proper methods of placement, set-up and use. Even if a ladder is the proper safety device for a given task, the placement of a ladder at a construction site must be done with the safety of a worker at the forefront. The ground must be safe and level and the ladder cannot be placed in any area where the safety of the worker may be compromised. 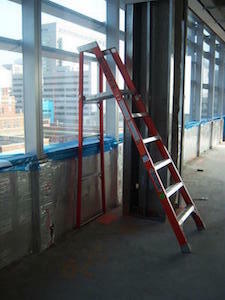 An accident resulting from a ladder being improperly placed may result in a finding of a Labor Law violation against the owner or the General Contractor based upon their failure to make sure that the workers at the construction site were able to perform their height-related job in a safe manner. In addition to New York law, Federal rules have been enacted to guide construction workers and companies on the safest methods of performing construction using proper and accepted ladders. For example, OSHA specifies the proper height, width rung-size, placement and a host of other requirements in order for a construction worker to use a ladder safely. Many attorneys in New York claim to handle ladder accident cases, but they do not possess the knowledge and familiarity with the applicable State and federal laws to adequately insure that their injured clients receive the maximum recovery possible. A law firm with the resources, experience, and personnel necessary to properly investigate and pursue the claim is crucial. Unfortunately, the dangers and risks associated with height-related work result in accidents where construction workers suffer extremely serious or catastrophic injuries involving foot and leg fractures, spinal cord injuries resulting in paralysis, quadriplegia, paraplegia, traumatic brain injuries or death. The New York Ladder Accident Lawyers at Gair, Gair, Conason, Rubinowitz, Bloom, Hershenhorn, Steigman & Mackauf advocate for our clients' full financial recovery through detailed, meticulous preparation for trial. If you or a loved one has suffered a serious personal injury or died as a result of a Ladder Accident, please contact our firm to discuss your case.